The artist-run-space ‘XYZ collective’ has just opened this summer in Tokyo’s Setagaya ward. The director, Mr, Cobra (a video artist/ Mihokanno member) alongside Mr. Soshito Matsubara (a contemporary artist/ Mihokanno member) and Ms. Madoka Hattori (an editor) have been taking the lead in working and managing these three business together: an artists office ‘SNOW Contemporary,’ a record store and a book label “Book Shop Yamato.” Their goal for ‘XYZ collective’ is to have both studios and alternative spaces managed by artists. It’s a gallery but more like a studios for artists. After a grand opening party, the very first exhibit, “Beauties,” by Mr. Hideki Iinuma from SNOW Contemporary, was held. Mr. Iinuma spent lots of time creating in Europe. Then he finally had his great debut in Japan this February during the art fair ‘TOKYO FRONTLINE.’ His pieces had stronger power than before. His wooden ladies had a stronger shape and expressed a mixture of deep and gentle calm on their faces. Mr. Iinuma usually uses fashion magazines as his motif. Then, he starts shaping the wood without a sketch. Sometime, his rough touch creates a speedy impression on his pieces. It’s hard to believe that his pieces are created with just one portion of a tree and an image from a magazine. SNOW Contemporary is planning on having exhibits four times a year. 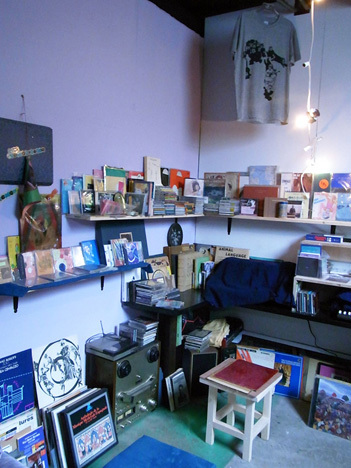 Next to the main space, a record store managed by Mr. Takenori Ohchi has its door open. Mr. Nogai from Clala Audio Shop is also contributing to the store as a partner. The wooden shelves, packed with records, provide a unique vibe like the attic of a European house. The store mainly carries records that can be played only on gramophones from the 1900’s, 16mm films and art books. Although this store is new, it has a nostalgic and fantastic vibe going on. This is probably because of the collection by Mr. Nogai. After the record store, there is a book label ‘Book Shop Yamato’ started by Mr. Masaya Chiba and Mr. Yosuke Bandai who are both members of ‘ Mihokanno.’ There is a huge book at a main door. 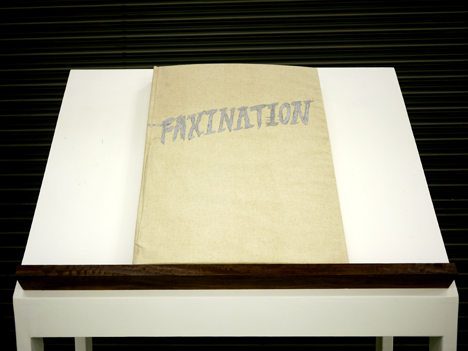 The book was made as a project ‘Faxination Japan’ by XYZ collective after the earthquake. 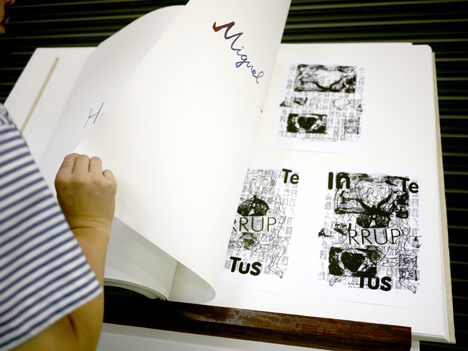 Every page has a message from artists all over the world via fax. All of the monochrome A4 sized papers are filled with creative expressions, which excite people while they face the body-sized book. Among many amazing pieces, the book also has pieces by Bill Saylor, Taylor Waxman, Yusuke Amemiya and Satoru Aoyama. The sponsor, Mr. Cobra, related the story of how the XYZ collective was started. Mr. Cobra visited Melbourne, Australia as part of an exchange residence program by Tokyo Wondersite. There, he was deeply impressed with an artist-run-space. It was then that he started to plan the opening of his own artist-run-space, the XYZ collective. After the fall of the Berlin Wall, spaces that were run by groups of artists naturally started to appear in Germany. Artists were undaunted by recession and adversity. Their activity even seemed to have risen when compared with before. The XYZ collective has the potential to connect various scenes, such as art, books, fashion and so on. If this space becomes a place for not only people who are in the same field but also people who can find things in common while in different fields, it must be very interesting. The XYZ collectives is located in a residential area about twenty minutes away from Shibuya by bus. Because of the residential area, audiences can enjoy art in a relaxed atmosphere. From there, it might be a nice idea to extend your journey to the hip stores in Mishuku. If people really want to make a little bit of time, there is always the chance to be away from a hectic city and to enjoy art.